I have been very fortunate to have spent 6 days of classes with Gloria Loughman, doing three of her classes. My first two days were some of the most enlightening quilt classes I have taken. They inspired me to TRY Free Motion Quilting for the very first time. This was in October 2004 and I was using a 30 year old Elna Supermatic that could not drop the feed dogs. From that class onward I then have quilted all my own quilts. The background was painte d with a heat set paint. The lightning strike was made using pieces of untwisted embroidery thread. Where the light couldn't get to the quilt the fabric remained white. I then stitched free motion the patterns of the strike, hills tree branches etc. The picture of the gorge was made using small squares for the forest, a few of the rocks are hand painted, the water in the river is also painted. 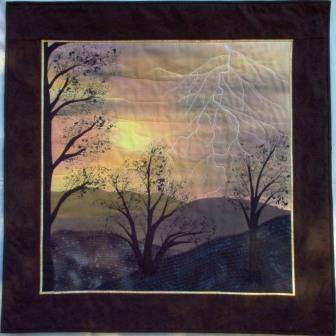 The tree fern in the foreground was my first try at 3D applique. Then covered my feed dogs and just scribbled the forest leaves, I won't show close-ups. Smaller rocks were quilted using embroidery thread in the bobbin.